(CNN) -- An exhibition of American artworks has just opened in Havana -- the first major American group show in Cuba for over 20 years. 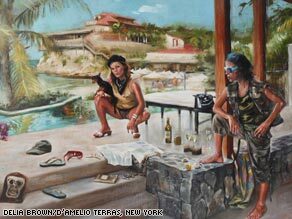 "Guerilla Villa," is one of the works on display at the "Chelsea visits Havana" exhibition. The "Chelsea visits Havana" exhibition is part of the 10th Havana Biennial art show, which opened on Saturday, and will take place at the prestigious "Museo Nacional de Bellas Artes." Works by more than 30 artists representing different galleries in New York City's modern-art hub of Chelsea will be on display. The exhibition is the brainchild of Alberto Magnan and his wife Dara Metz, owners of Chelsea's Magnan Projects art gallery. Magnan told CNN that he hopes the exhibition will lead to closer ties between the U.S. and Cuba. "We're hoping that art could be a tool to be used as a started up point for communication between the two countries," he told CNN. "We're such close neighbors that we just need some kind of catalyst to help get things started." The last Havana exhibition by American artists was a 1986 show organized by Havana's Wifredo Lam Contemporary Art Center, but Magnan says his show is the biggest American group exhibition in Havana since 1958. Although the sale of art is not covered by the U.S. trade embargo on Cuba, travel restrictions have limited cultural exchanges between the two countries. "A lot of Cubans can't travel to the U.S. so we thought it would be great to bring the exhibition to Havana, so Cuban artists and ordinary Cuban people can see what are the current trends in art in New York," said Magnan. While some Cuban artists complain of government censorship of their works Magnan told CNN that he was given no restrictions by the Cuban authorities as to the kind of works he could display, and that a number of the artworks make strong political statements. Works include "Castrobama," by Padraig Tarrant, which has cutout profiles of Barack Obama and Fidel Castro painted red and facing each other. "Animal Farm -- McCain and Palin," a painting by Tim Rollins and K.O.S., a South Bronx art collective, depicts the head of Sarah Palin on the body of a moose. Magnan says one of the highlights so far has been a St. Patrick's Day parade celebrating Irish-Cuban culture, organized by Duke Riley, one of a number of the exhibited artists who have accompanied the show to Havana. "The Cuban people responded incredibly to that. The streets were closed, they had Cuban bagpipes and they plan to make it a yearly event," said Magnan. "Chelsea visits Havana" runs until May 17.